Pest description and damage Many species of this aphid-like insect feed on newly growing needles of spruce although each species forms unique galls in different sectors of the tree. The adelgids fly to spruce from Douglas-fir, then begin to excrete waxy filaments. Within the protection of the filaments, the small purplish female lays clusters of tan eggs. 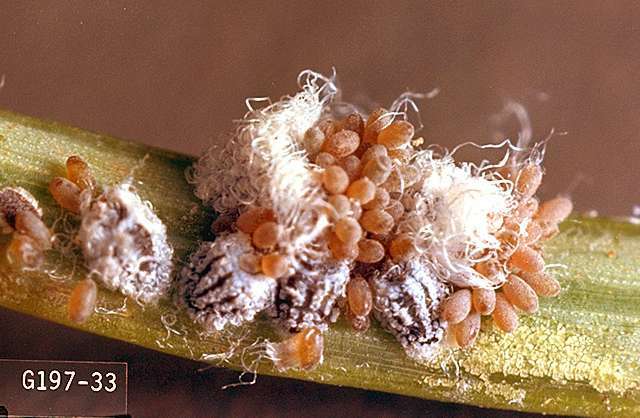 The eggs hatch and the nymphs begin to feed on the expanding new growth needles. The needle bases swell, encasing the nymphs within the protective, green cone-like galls. 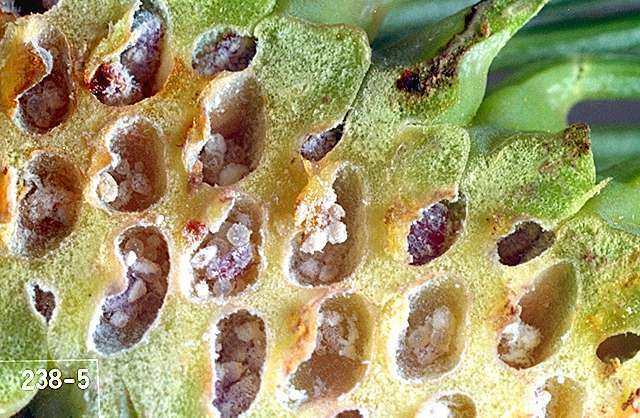 In July, the galls dry and crack open, releasing the adelgids, which then fly to Douglas-fir. 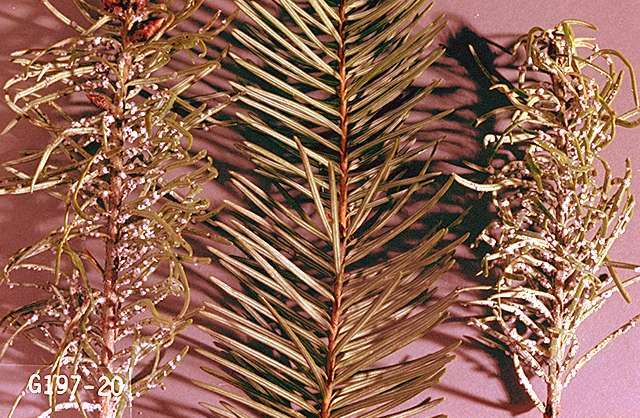 On Douglas-fir, feeding on the needles only causes some yellowing and minor distortion of the needles (no galls). On spruce, feeding and galls can significantly disfigure branches of the tree. Biology and life history In spring, winged adelgids fly to spruce where they form cottony tufts within which to lay clusters of eggs. 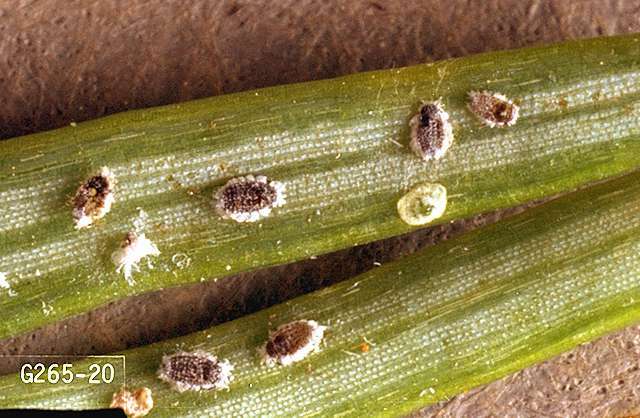 When the crawlers hatch, they move the expanding buds and begin to feed on needles. In response, the bases of the needles begin to swell over the crawlers. As the needle bases swell, they form a cone-like gall. These distinctive galls are green through spring and early summer, but later they begin to dry up. As they dry, they shrink and crack open, releasing the adelgids. The adelgids then fly to Douglas-fir where they will cycle a generation then return to spruce. Plant Douglas-fir and spruce as far apart as possible. Hand-prune and destroy any gall on spruce before these galls open. The usual adelgid and aphid parasitoids and predators, including small birds.